Anyway, after I stopped turning cartwheels, a mild feeling of apprehension set in. As an Austen addict whose obsession exceeds even that of the protagonist of my novel, my mind is so full of the text that often I must watch a new film adaptation twice just to see if I like it or not. The first time I watch, my mind is buzzing: Did the screenwriter/director stay true to text? Why did they add this scene or cut that one? Not exactly the uncluttered frame of mind one needs in order to sit back and enjoy the story unfolding on the screen. But this new Sense and Sensibility? That called for three viewings before I could even see it as a film unto itself. Not only was the novel echoing in my head, but the Oscar-winning Ang Lee/Emma Thompson movie, which is perhaps my favorite of all the Austen-related films, demanded comparisons at every turn. Nevertheless, I'm happy to report that I find myself in a state of admiration for the new Sense and Sensibility. A review by Amazon UK's editorial staff addresses the inevitable comparisons to the Ang Lee/Emma Thompson film by suggesting that "it's perhaps best [to] see them as companion pieces." I agree. The luxury of this particular film's nearly three hours of screen time provides more opportunities to stay true to text, which we devotees of text certainly appreciate. However, this film, like most adaptations, includes expanded and even invented scenes, something I have no objection to, as long as they serve the story and character development. Most important is that the new film, like its predecessor, captures the spirit of the book. It is the story of two sisters, Elinor and Marianne Dashwood, who represent the contrast and interplay between sense and sensibility. Elinor, the "sense" sister, feels deeply but would rather keep her pain to herself. She simply does not want to add to the grief of her newly widowed mother and highly wrought sister Marianne, the "sensibility" sister. But Austen's story is far more complex than a mere comparison of opposites, for neither sense nor sensibility can preserve either sister from heartbreak or from making incorrect assumptions about the man she loves. The difference is in how each sister deals with her challenges. Marianne continually puts herself in harm's way by flaunting convention and taking dangerous risks that nearly cost her life as well as her reputation. Elinor builds inner strength through service to those she loves and acceptance of what she cannot change. "...we met by appointment, he to defend, I to punish his conduct. We returned unwounded, and the meeting, therefore, never got abroad." Even if a modern reader realizes that "meeting by appointment" means a duel, it's unlikely that he or she does more than sigh, like Elinor, over the violent manner by which some men settle their differences. But I doubt anyone gives the duel itself much thought. In the film, Andrew Davies took Brandon's spare account of an off-stage event and turned it into an immediate scene. Smart thinking. After all, why not take full advantage of this inherently visual medium? And what's not to like about two men in billowing white shirts clashing swords? But more important than the eye-candy factor is that we, the audience, get to see Colonel Brandon in all his manly glory, thus getting us to want him to win Marianne in the end. Having nearly three hours of screen time also enables us to observe more of the public yet secretive courtship of Marianne (the lovely Charity Wakefield) and Willoughby (Dominic Cooper). The camera follows the pair from dances at Barton Park to an erotically charged scene in which Marianne allows Willoughby to cut a lock of her hair. We tag along as they explore Willoughby's future estate at Allenham, two kids in love wandering through a fairytale mansion alone and unchaperoned. In that scene, which exists in the book only via secondhand accounts, we see Marianne teetering on the edge of a no-turning-back, sexual-awakening moment that is as relevant today as it would have been then, and we are nearly as swept away as she. The most controversial choice that Davies made was the opening scene, which shows a seduction. Although the scene is an invented one, what it portrays is the actual backstory of the book. While some have dismissed this choice as mere prurience and/or a wrongful sexing-up of Austen, I disagree. By playing out existing backstory as a scene, the filmmakers show how dangerous it was for a single woman of Austen's era to stray outside the bounds of propriety, and how precarious her position in society was. Thus Marianne's near-fall from grace creates even more dramatic tension than it might have done without that opening scene. Even the setting itself is dramatic, though Austen did not situate the Dashwoods' cottage in the windswept, wave-battered cove we see in the film. Somehow the sea becomes almost a character itself, its crashing waves an elemental manifestation of Marianne's wild excesses as well as the emotions that Elinor (the excellent Hattie Morahan) feels but keeps to herself. In the book, master storyteller Jane Austen convinces us that after getting over her disappointment with Willoughby, Marianne does indeed end up loving Brandon with her whole heart. We not only accept it, we feel that Brandon deserves Marianne as compensation for his past sufferings and present forbearance. In the movie, Davies takes things further. 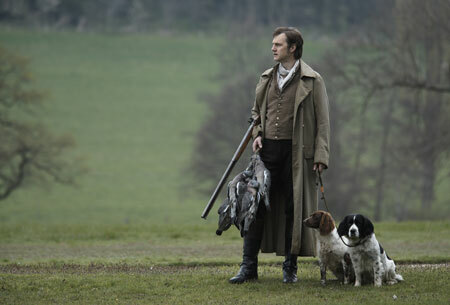 He lays the foundation for a romance between Brandon (the appealing David Morrissey) and Marianne early in the story. We see Marianne approving of Brandon's mind, his conversation, his taste in literature and music. It is only when she realizes that everyone around them is pairing them up romantically that she withdraws, quite naturally shocked, as any seventeen-year-old girl would be, at the thought of marrying someone so ancient as a man in his thirties. Davies invents another scene that shows Col. Brandon with a falcon, which illustrates that Brandon has the strength and gentleness to tame not only the falcon, but Marianne. These invented scenes, along with the duel, help prove that Brandon has the requisite qualities (not to mention the attractions of his tragic romantic past), to win Marianne's heart. Another invented scene shows Brandon promising his ward Eliza, out-of-wedlock baby in arms, that he will take care of them. We see that Eliza does not really comprehend that her seducer has abandoned her for good. By bringing Eliza out of the shadowy place she inhabits in the book and placing her in the foreground, her tragedy becomes tangible. Which is why we cannot for a moment wish for Marianne to end up with the man who would do this, and thus why the scene that Emma Thompson wisely chose not to include in her script, i.e., Willoughby showing up to try and make amends--actually works well in Andrew Davies' adaptation. This scene was a tricky one to pull off in both book and film, for in the book Elinor herself was moved by Willoughby's sufferings. The only unfortunate omission in this adaptation is in Lucy Steele's character. She is not quite the conniving, jealous little manipulator that she was in the book. Consequently, the motivation for Edward (the dishy Dan Stevens, who has a wet shirt of his own) to two-time Lucy (if only lust in his heart, but still) has less weight. Davies nearly makes up for it, however, by bringing to the screen Anne Steele, Lucy's beau-daciously ridiculous older sister, and giving her a laugh-out-loud piece of dialogue. I couldn't possibly conclude without mentioning Janet McTeer. This stunningly talented and beautiful actress is understated and riveting as Mrs. Dashwood. One absolutely feels that the only adult in the family is Elinor, but we like her mother none the less for it. Finally, what is most satisfying about this film is how Davies has Marianne sum up the wisdom she has gained in contemplating her manifold errors in judgment: "It is not what we say or feel that makes us what we are. It is what we do. Or fail to do." And on that note, I most certainly won't fail to watch this film again. Or to re-read Sense and Sensibility, to which it owes everything, at least once a year. Great review, Laurie. I also thought it was a mistake to downplay Lucy Steele, but by and large I found this adaptation of S&S surprisingly good. I didn't think anyone could surpass Kate Winslett's interpretation of Marianne. While Charity Wakefield didn't, she put her own sweet and memorable spin on the character. Hattie Morahan IS Elinor. No offense to Emma Thompson, but she was simply too old for the part. Dominic Cooper was not a believable Willoughby. He simply wasn't scrumptious enough, and one wonders why Marianne preferred "The Artful Dodger" all grown up over Captain Brandon. As for the opening scene, why did they bother to add it? The titillating factor was zero, and it added almost nothing to the film. However, aside from the false start, I hugely enjoyed this adaptation. What an excellent way to end the Jane Austen series! Great review Laurie! I think a great deal of the humor went away when Lucy Steele's best lines were cut. Making Willoughby a villian so early on let the cat out of the bag too soon. Over-all, a great new adaptation. Laurie, you might have had a hard time separating the two films because the screenwriters/directors made so many of the same choices in their excursions away from the book. But I totally agree the extra time helped--and I would really have liked to see another hour. Some of the plot development was a little fast. Davies nearly makes up for it, however, by bringing to the screen Anne Steele, Lucy�s beau-daciously ridiculous older sister, and giving her a laugh-out-loud piece of dialogue. I always had trouble with Sense and Sensibility, as a novel, because the Elinor-Edward relationship happens offstage, before the action of the novel. Emma Thompson "fixed" that in her screenplay, making it the best Austen adaptation for me (Greg Wise' presence didn't hurt either). If we can accept that offstage action being brought into both movies, why not the offstage action of Eliza's seduction? It makes her ruin a reality and we clearly see how close Marianne comes to the same fate. Thanks for the chance to discuss this! I've only seen the first installment but so far I thought it was pretty good. I also thought that Emma Thompson was much too old to play the role of Elinor and glad to see a more age appropriate actress in the role. I'm anxiously awaiting the next installment next week. I will be sad to see these end though as I've enjoyed watching the series. This is my favorite Jane Austen movie second to Pride and Prejudice. I enjoyed this version very much but I have to complain about the loud music in the background. Sometimes it was so loud I could barely understand what the actors were saying. Only saw #2 of this S&S. I agree that this version has a younger, more plausible Elinor - as well as a younger Col. Brandon than the Ang Lee version. And I am reminded - again - how Austen shows how cruel Willoughby was - to seduce a girl in a time when he would have known she would be ostracized, but he - merely considered a "rake". This age has different cruelties women, girls experience, which some young males choose to ignore, and which society mostly ignores. But at least the social standards are not as unforgiving. --as they deal with those young males whose hormone levels are greater than their moral sense. It's been too long since I've seen the first S&S, but one of the first things that struck me about this recent one was that this younger Elinor was more believable. If I'm remembering correctly, Lucy Steele's character in the first S&S was more like how others before me have said she was portrayed in the novel (which...are you ready?....I have yet to read!). Also, the youngest Dashwood daughter was focused on a bit more in the first S&S. But, I don't recall the first one showing her doing drudge work once they got to the cottage, and this one was a more realistic portrayal. I enjoyed her keen insights into the "plight" of women in their world as opposed to men. These realities would be so in your face that they certainly would not be lost on a child by the time they've reached her age. I must say here, too, that what endeared me to Edward a bit more in the first S&S was his interaction with this young girl. They didn't actually show that much in this one and, had I not seen the first one, I would have wondered why she was always so excited to see him when he came. I think the scene in the beginning would be confusing to someone who came to this story for the first time through this installment. Perhaps a better way to have included it would have been to show the 15-yr.-old remembering it (dreamily) after Col. Brandon left her. It would have worked, since they portrayed her as still so obviously pining for Willoughby. One more thing: Why, oh why, didn't they let us know this would be shown in 2 parts (2 different Sundays)? If they did ahead of time (before airing first week), I missed it. Since I was recording it onto a DVD which already had "Emma" on it, I didn't have enough room to add the second part onto the same DVD....which would have only fit two complete stories (at the speed I used) if they were both the same length. Not an ideal DVD to have, one complete story, and the first part of a second story. Great review! Your thoughts open the possibility to endless S&S blogs. As an avid Janeite, I found this adaptation good and agreeable. I believe the actors who portrayed Mrs. Jennings, Sir John, and Mr. Palmer were far superior in Emma Thompson's adaptation. I agree the plot development was faster in some areas and left the viewer searching and wanting more. While the ending in the first S&S was amazing, this version also kept the viewer wondering if Elinor and Edward were married or just chasing chickens. Laurie, I didn't read your review until I saw both installments because I wanted to remain unbiased. So now, the day after, I agree with your entire review, ha! I thought the opening seduction scene perfect; excellent back story. Ambiguos to those who may not have read the book -- kept it in the back of your mind (as I was explaining to my husband to "Just wait, you'll see...") The added scenes were more successful than in other adaptaions -- but then again, it is an Andrew Davies work. I did like the treatment of the scene with Willoughby and Elinor at the Middleton's; but thought his portrayal at leaving the cottage in the first installment could have been better had he shown more anxiety at the loss of his beloved as well as his favor with his rich aunt. He seemed almost "smug." I admit I thought the first night was extremely sensual and stronger than the second half. But I enjoyed it just the same. Now I am anxiously awaiting my copy of the DVD from Amazon! so I can watch it again, and again, and again. PRONOUNS! PRONOUNS! PRONOUNS! How distressing to hear upper-class (not the servants) speakers repeatedly misuse the personal pronouns. Please, someone, find an editor to repair these breaches. Great Production. Enjoyed your review. Deliberately refrained from reading it and any comments until both segments aired. Don�t know when or how it happened, but somewhere along the way I stopped comparing this adaptation to the Lee/Thompson movie (which I love), and started enjoying it for the superb piece of work that it is unto itself. As for the seduction at the beginning, I don�t think it gives anything away, or takes anything away from the story. Only those who are familiar with the work were aware of its meaning. It is not uncommon for a movie to show a scene at the beginning, the meaning of which only becomes significant much later as the story unfolds. Loved Morrisey/Colonel Brandon�the actor�s performance and the character. It was not his manly duel with Willoughby that won my heart. But, when he, out of nowhere, catches Marianne as she faints away, I thought, �He is going to always be there for her.� He also had my best -loved line. As he leaves Marianne in his library, he says to her �come and find me when you are ready.� That line is so poignant that in your heart of hearts you just know he is not talking about when she is ready for her ride home. As for Willoughby coming back seeking forgiveness. I�m glad the writer chose not to portray Elinor as showing him some weepy-eyed compassion. My-aunt-cut- me-off. I-was-going-to-lose-my-home. I-don�t-love-my-wife. I�ve-lost-the-woman-I-love. I�m-miserable-blah-blah-blah. Well! Weren�t-all-these-conditions-of-his-own-making? I remember a joke I heard once about the guy who kills both his parents, and when he is caught he pleads with the court to show him mercy because he is an orphan? I didn�t hear Willoughby begging for forgiveness for the misery that he caused, only for sympathy for that which he is suffering. His final banishment by the �sensible" and usually understanding Elinor removes all doubts (if there were any left) in the viewers mind as to Willoughby�s worthiness. I taped S&S and my recorder got to the part where Marianne was running in the rain. I haven't read the book. Could someone please tell me the ending? Pat, be good to yourself and read the book! Don't cheat yourself out of an unforgettable first-hand experience. Then get the DVD. You won't regret it. Excellent, thoughtful review, thank you. For the first time that I can recall (given how many times I have read S&S, and watched the Ang Lee version), I cried during the second half of this latest version. For the first time I was actually able to feel empathy for Marianne, whereas previously I clearly felt more like the character of Elinor. I enjoyed these two actors in the roles over Thompson and Winslet, perhaps because they were revelations but also because this "little" film so beautifully matched the book in terms of style, depth, and sensitivity. This version just felt more "real" to me than the big-star Lee version. Your views on the Steele women were spot-on -- I too missed Lucy's cunning, although it's more than made up for with the absurdity of Anne. The relationship between Brandon and Middleton was far more interesting in the Lee version than in this, and while that's not especially important, it gave us insight to Brandon that this version doesn't provide. Similiarly, this Willoughby was simply not at all the dish Greg Wise offered himself to be, hence my difficulty imagining him to be as enthralling as Wise's portrayal. I so much appreciate the gift of this latest adaptation! Marianne's words in the film: "It's not what we say or feel that makes us what we are, it's what we do, or not do," -- they are not in Austen's novel, are they? Thanks for the wonderful review Ms. Rigler. I too loved the S & S adaptation. There was one moment at the end of the film that was especially touching: Elinor is sitting on a bench quietly looking out to a calm sea. Although her back is to us, she looked sad and resigned to me. It is heart breaking. That is all do to the great acting and script work that came before that moment. By the way, I met you at the Vancouver JASNA AGM. I am impatiently waiting for your next book. Hi, Bill--good to meet you again, and please call me Laurie! Thanks for the kind words. I'm working on the sequel to Confessions of a Jane Austen Addict. I too was touched by Elinor's sadness in this movie, and I agree that the actors were stellar in this film. For me what also made the experience particularly moving was the music. I hope that someone releases a soundtrack of this film. I thoroughly enjoyed the BBC adaptation of S&S as the other Jane Austen broadcasts. I also enjoyed and own the movie version. I was wondering though, if anyone noticed the similarities in the voice and speech pattern of Emma Thompson and Hattie Morahan and the looks of Hugh Grant and Dan Stevens? I too enjoyed this version of S/S, very much. It was a bit more smoldering then Thompson's version. While there are good things about both, I found the actors age in the PBS version, more believable. I thought Thompson and Winslet way to old for the parts. Although they did give great perfomances, it was an obstacle for me that wasn't as apparent at first until I viewed this adaptation. And while I like Alan Rickman (Brandon), he was also a bit dry as Brandon. Morrissey however, was pretty good, when he didn't speak. His voice was a bit of a distraction. But his looks are, yummy. I also like PBS' Edward better than Hugh Grant. Hugh was way to whimpy for me and way too young looking too play love interest to Elinor. In the scene where Brandon is taking the 3 ladies back to their cottage, the costumes and horses do not match up. If you notice them leaving Cleveland for home, you'll see, all three horses are white. (Brandon's and the coach's). When they arrive at Barton Cottage, the coach horses are brown. Also, Elinor has on a long coat (look at her lapel in the coach on the ride home), they are big and pointed and she has a dark hat with dark ties. But when her mother smiles across at her (still in the coach), you can see the corner of a tan hat, (as if they added that shot of her mother from another scene). And when they arrive at the cottage, Elinor has on a lighter hat and a short waist coat. I think they shot two scenes on the same day. The scene when both girls are arriving at the Middleton's after leaving London and then the scene when they are returing home to the cottage. Because everything matches up in the coach. Anyway, it was just something I noticed. Personaly, both adaptations were quite wonderful. Also noticed the voice thing. Was strange hearing Emma Thompson�s voice coming out of Hattie Morahan's mouth. Aside from the fact that she is a wonderful actress, wonder if her Emma-Thompson-voice had any impact on her being cast in the role. Didn�t think Stevens resembled Grant. Although they are both good actors and gorgeous, really preferred Stevens�s portrayal of Edward. Thought Grant�s was little too bland. To answer your question, Celia, those words are not in the novel. But they do sum up the lessons that Marianne learns in the book. Thanks for a good review and some great comments. One weakness, I think, in all the reviews (and, ah, curious, I've looked at dozens!) is that the reviewers of course all knew in advance of Elinor's spiral down and the astonishing turnaround outcome. No surprises to them there; yawn. And so the truly astonishing power to the first-time viewer (ie, me!) of Edward's proposal to Elinor's quivering back, and then her electric response, and all the the heartbreak that precedes it, just isn't talked about. By the way, Kate Winslet wasn't old; at 19 she was only about half Emma Thompson's age. I admire Emma for getting into that one; my brief checking-out suggests it was never her original intent. Tough on her now. I had never seen the Thompson version until prompted by seeing the Davies version last week, and I agree with the view that the two compliment each other. On the whole I think that Thomson's version is superior, but not significantly superior. The added material of the Davies version is on the whole worthwhile, but some of it is just candy for the completist. Hattie Morahan is more age-appropriate and did a very fine job as Elinor. However, ultimately I believe that Thompson's Elinor was a bit more satisfying. There was one scene which really made the 1995 version work for me. The scene is where Mrs. Jennings reveals to Marianne than Edward is engaged to Lucy and has been cast out for it. After yet another condescending remark from a supposedly chastened Marianne, Thompson's Elinor delivers a blistering rebuke which brings Marianne to tears. For me, this was as important to the movie as Marianne learning of Willoughby's faithlessness. I believe that Marianne thus finally understands that she has all along treated people around her as if they must not feel, just because they don't show it as she does. The scene gives Marianne cause for true self-examination over her past treatment of Elinor and Brandon in particular. Compare this to how the scene was played in the Davies version, which was more in the nature of a sisterly confession than a stinging slap. Col. Brandon is another interesting comparison between the two versions. There are certainly things to like about each. Alan Rickman's mellifluous tones and overall superior acting ability recommened him over David Morrissey. However, Morrissey is more age-appropriate to the novel, and his apparent age-difference with Charity Wakefield is perfect. (Rickman 52 - Winslet 19 = 33 year gap/Morrissey 43 - Wakefield 27 = 16 year gap.) Although usually I have no problem with age gaps in relationships, Rickman looked enough older than Winslet for it to be somewhat of an issue for me. Rickman's and Morrissey's portrayals are remarkably different outside their love for Marianne. Rickman's Brandon is more a mellow country gentleman of leisure; Morrisey's is meant to be seen as a man who would knock your block off for trifling with Marianne. Very differnet approaches, and intentionally so. I have to say that Davies' approach was the more satisfying, given other elements of the plot. Davies' decision to expand Brandon&Marianne throughout, including in particular the duel, was an excellent one. By the end one is thus willing to believe that Marianne has truly seen what was there all along and is not just "settling." By contrast, in Thompson's version I was never able to completely shake the notion that Brandon was just Marianne's fallback position. There simply wasn't enough material to show me otherwise. 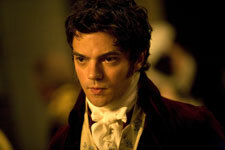 As with many people, I feel that Dominic Cooper was dreadfully miscast as Willoughby in the 2008 version. He's supposed to be handsome and suave, but instead he looks like a complete twerp. It makes one wonder why Marianne would fall for him at all, given than she is operating at this time on the basis of looks and shallow blandishments. Perhaps David Morrissey was too good-looking to play Brandon, but I feel that this would have been a non-factor had Willoughby been properly cast as a man who was just more dashingly handsome in comparison. For example, Dan Stevens (Edward Farrars) would have made an excellent Willoughby. This decision is IMO the only significant missstep of the 2008 version. Charity Wakefield is quite lovely, much more so than Kate Winslet. Kate Winslet is a superior actress in this role, but not greatly superior. Wakefield has in her favor Davies' decision to expand on her relationship with Brandon before the end, where IMO Winslet is handicapped by the lack of such material. She comes off as perhaps a bit mercenary in the end. In the supporting cast I favor almost all the 1995 version, especially Sir John Middlefield (Robert Hardy) and Mrs. Jennings (Elizabeth Spriggs), both of whom were delightful. In conclusion, I feel that the individual performances are mostly superiour in the Thompson version, but Davies usually made better choices about what needed to be emphasized to make the story work. Such stimulating comments all around! And it is particularly fascinating to hear from someone who didn't know the story in advance of seeing the movie, and someone else who saw the Davies version before the Thompson version. One thing I have never quite understood is the sympathy for Willoughby. 1) He doesn't ask for forgiveness for the wreckage he's created; he asks for pity for his own suffering. It's merely a continuation of the selfish behavior which led him to this point to begin with. 2) Marianne came through wiser, happier, and altogether better off for the whole unpleasant business. In contrast, Beth's life is quite probably wrecked or at the very least drastically curtailed, even if Col. Brandon forgives and takes care of her. Nowhere does Willoughby show the slightest concern for Elizabeth's fate. 3) One question which Austen herself doesn't ask, not to mention the average reader, is that given Willoughby's well-established character within the novel, does anyone believe that Elizabeth and Marianne are the only two casualties in his wake? They are merely the two that Jane Austen writes about. Once you think about it, it's not hard to imagine a few more anonymous Elizabeths. I have zero sympathy for the character and I think he got off lightly. Brian, your abhorrence of Willoughby is understandable. However, I do understand Elinor's inclination to take pity on Willoughby. I think it is a relief to realize that someone who has wronged a loved one, or who has wronged oneself, has some regret, is suffering, is not a completely wicked, calculating, cold being. "Willoughby, he, whom only half an hour ago she had abhorred as the most worthless of men, Willoughby, in spite of all his faults, excited a degree of commiseration for the sufferings produced by them, which made her think of him as now separated for ever from her family, with a tenderness, a regret, rather in proportion, as she soon acknowledged within herself--to his wishes than to his merits. She felt that his influence over her mind was heightened by circumstances which ought not in reason to have weight; by that person of uncommon attraction, that open, affectionate, and lively manner which it was no merit to possess; and by that still ardent love for Marianne, which it was not even innocent to indulge. But she felt that it was so, long, long before she could feel his influence less." My own reaction to Willoughby in that scene (in the book, not the movie) varies depending on how I am feeling when I read it and at what stage I am in my life, and this is one of the things I love most about Jane Austen. As Elizabeth Bennet said in Pride and Prejudice, "People themselves alter so much, that there is something new to be observed in them for ever." As I alter, so do my responses and insights when I read Austen. Her characters' responses are so complex, so resonantly human, that there is something new to be observed in them for ever. Also, I don't think that anyone who has done a close reading of Sense and Sensibility would doubt that Willoughby began and ended his seduction of women with the younger Eliza. Only that he was on the verge of reform, at least with respect to one woman, Marianne.